Last week felt like a week of madness. Sometimes I talk about “spiritual weather” or energies that I’m feeling that seem to be affecting us all. I don’t pretend to be an expert on these matters, but I do find that people appreciate when I can share what I notice is going on. Last week, on Sunday, I felt as though I really wished to completely retreat from the world. I went to Kundalini Yoga class. I did some work, had a meeting, I celebrated my brother’s birthday with family. but I really wasn’t up for much connection with others. Monday was the day that Notre Dame caught on fire. I prayed about it, but didn’t wish to focus on it, as I had a lot of work to do that day, counseling, plus teaching, and I kept my focus. That night I was awakened in the 3 o’clock hour to pray. I can tell when Spirit wakes me up to pray, it’s a different kind of waking in the middle of the night. I sometimes wake in that 3 o’clock hour and use the restroom, pray, and go immediately back to sleep for another couple of hours. Not on Monday. I got up to pee, started praying, and began to notice a very intense, oppressive energy that seemed to be all over the planet affecting all humanity. I kept praying until about 7 a.m. and the whole time I felt that I was helping to lift off a dark energy. I can’t say I’ve felt anything just like that before. It felt like a battle. Finally I decided, “Enough.” And I moved into my day. Later that day I was talking with friends and discovered that as they were putting out the fire in Notre Dame, there were fires in two Buddhist temples in the United States. I later learned there was a fire at Temple Mount in Jerusalem, which is considered to be the third holiest site in Christianity. Perhaps there were more fires in religious sites and communities I’m not aware of. On Wednesday, I told another friend about how strange the feeling was on Monday night, and she confirmed that it had woken her and several other of her friends around the world. It was a real happening. Last week, I felt some of the energies that I used to feel when I was really freaking out in the ego muck and mire. I was grateful that, while they were intense, I could easily rise above them and not succumb. For me that energy can feel very “wiry,” like I’ve had WAY, WAY, WAY too much caffeine, or there’s major fear, a major threat. There is no safety. Fear rules. That’s the best way I can describe it. It does feel like madness to me, and that’s the thing about the ego thought system – it is inherently mad. A tiny, mad idea blown up and writ large on our psyche. My practice of prayer and mindfulness allows me to recognize these things, but not to give in. It can feel like a strong temptation to go with that intense energy – it used to feel very magnetic, pulling me into it’s whirlpool of madness. I can remember one of the last times I felt it very strongly and it definitely felt like madness. I’d like to know if you felt any of these – please share with me in the comments below. We don’t have to pray for anything except Peace and Harmony. That is the perfect prayer. We pray to release the blocks to Love, Peace and Harmony and allow ourselves to be lifted and carried above the battleground. Very important: and this cannot be over emphasized, resist the temptation to label, analyze, interpret, make meaning of what your experience is. That just keeps us in it. Spirit knows all about it. It’s an ego attachment to try to label and make meaning of things. It’s not helpful. If we’re truly interested in knowing what things are for, we can open our mind and ask Spirit to make it plain. Simply focus on releasing the blocks to Love, Peace and Harmony and allow Spirit to inform us. But even that isn’t necessary for us to be lifted and carried above the battleground. Our willingness is ALL that is required. It’s our willingness to let go of trying to understand that liberates our mind to actually know. I’m so grateful for the power tool of prayer that is my foundation. Prayer got me through last week feeling better than ever. I am grateful! Please share anything related in the comments section below – I’d love to hear from you! Thank you! It’s Easter morning, the sun is rising here in New Jersey, and I’m going to share a bit of my crucifixion journey with you. I wasn’t nailed to a cross. I wasn’t tortured by someone else. The pain of it was that I was doing it to myself. I was torturing myself. The primary way that I made life so hard and painful for myself was the way in which I chose to look at everything – which was completely under my control. I was a fault-finder. I was a chronic complainer. My trust and faith were in my own opinions, and my own ability to control and manipulate people with anger. And until I changed that, I was the perpetrator of my own crucifixion. I expected to be let down by others. I expected to be rejected. Sometimes I would even hurry the process of disappointment and dejection so that I could just get past the inevitable. Right now, I’m very blessed and I’m highly aware of it. We’re at a place in the Masterful Living Curriculum (my yearlong course) where I get to have 1-on-1 meetings with the folks in class. I get to know them better and learn about what’s most important to them. I really LOVE this opportunity to get to know people from all over the world who are on this personal healing journey together with me. One of the most common things I hear from folks is that they have been in A Course in Miracles Study Groups and studying ACIM for years with little sense of really shifting their life and relieving their challenges. I can SO relate to that. For years they studied and took classes, went to retreats, meditated, and did all kinds of things without finding a whole lot of relief or a deepening connection with God. They tell me that in just a short period of doing the work in our classes they are having more healing, more expansion, more connection with Spirit than in YEARS of study. That’s exactly what happened for me. EVEN THOUGH I was studying spirituality ALL THE TIME. And there was my crucifixion. Until, I decided to go for it. To really LIVE it, for REAL. Deep down, we know that spiritual growth and healing isn’t an intellectual process. We really do KNOW it. In our heart, we know that we’re hiding behind the study and the books. … and we KNOW it. We know that being half-baked, kind of-sort of “in” doesn’t heal our mind. I was a student for so long – searching and trying and studying. I was a really good student. I was good at seeking, but not REALLY finding. Now I feel more like a devotee or a disciple. Devotion is a way of life. It’s a way of being. And I get that it’s not for everyone. But it has been my path of greatest happiness, fulfillment, Joy, and success in my relationships and in my contributions to life. I’ll be honest, I avoided this shift of going ALL-IN because I thought I’d have to give up the things I enjoyed and the pleasures in life. I really didn’t want to give those up, because I felt like that’s all I had. I had all of those. I did. I didn’t want to give up any of that, and more. Cigarettes. I really truly used to feel that those “pleasures” were ALL that I had. Those indulgences were all that was “for me”. Everything else was for someone else, and it was hard, and difficult, and confusing and NOT FUN. Those “pleasures” were all that stood between me and total unhappiness. As I write these words on Easter morning, I’m remembering what that crucifixion energy felt like for me. My shift didn’t happen overnight or because I read a book. My shift came through really LIVING the teachings of A Course in Miracles. I began to apply it day by day. I began to focus on the practical application, and I made that the focus of my life. Now I can see that I made the RESURRECTION the focus of my life, instead of the crucifixion. – to living in the present, choosing resurrection. All I’ve really had to give up is the causes of my suffering. I gave them to Spirit for healing, and they have been healed. I have challenges every day, but I don’t suffer. And my own personal repeating patterns of crucifixion. This weekend we’ve had Passover and Easter, as well as a full moon. It’s a time to take stock and, for me, it’s a time to choose resurrection. I am releasing all vestiges of the crucifixion. I am focused on resurrection. I am choosing resurrection of the awareness of my true identity. This is my focus and my intent. IMPORTANT: I’m committed to releasing the habits of learning through the contrast of my experiences, and I am choosing to dedicate and devote myself to remembering the truth instead. I’m not giving it up. But that’s not how I prefer to learn anymore. I’m willing to have direct insight and follow it. I’m more clear than ever that we can remember the truth, rather than try to understand it through experiential learning, which takes time. And that’s what I share in my classes: How to become that active, happy learner rather than having to repeat the same painful patterns for years on end while our ego becomes so spiritual trying to learn what our Spirit already knows and the ego never will. Through my practice of prayer, in the way ACIM teaches, I learned that what Earnest Holmes, the founder of Science of Mind, said is true: “The only time it takes to have a healing is the time that it takes to have a realization.” Our realization of our own Wholeness, Beauty and perfection is at hand. The time is now. It’s our belief that healing takes time that we must surrender. It’s a false construct that no longer serves us. We are in the time of transfiguration and resurrection. We can have a realization of Wholeness now. Because we have believed healing takes time, it seemed to be so. It’s not true. It’s a false concept. Time is nothing and it has no power. There is one power: Love. Love is our healer because Love is what we are. When we remember to Love, we are healed of false perceptions. Love IS a realization of the truth. The truth is a revelation of Love. I am already as holy as holy can be. I cannot become any more holy. My work is to remember this is true and stop forgetting. ACIM says, “Your task is not to seek for love, but merely to seek and find all the barriers within yourself that you have built against it.” T16:IV:6 We’re already there. We already have the golden ticket! Our journey has been one of forgetting and remembering. That’s all. We forgot our true identity, our Wholeness, our Beauty and our Perfection. The way to remember it is to seek the Kingdom first. The Kingdom is within. It’s in our own heart. It’s already there. ACIM tells us that our heart is the Altar of God, and that the barriers to Love are the false idols we have upon the altar. We must be willing to release our attachment to the false idols by letting go and giving them to the Higher Holy Spirit Self for healing. That’s all. That’s it. And then, we’re sure to have everything added unto us. The full realization of our true identity will be revealed. It’s only hiding behind the crowd of false idols upon the altar of our heart. Consider how emphatic he is. When we’re holding onto grievances, we don’t know what anything in our life is for, and we don’t have a single clue as to what would make us happy. That’s clear. That’s not hard to understand, unless we’re willing to sacrifice our happiness in order to hold onto our grievances. And for a long, long time, I was willing to make that sacrifice, but not anymore. I finally realized that there’s no way I can let go of the pain of the past as long as I keep interpreting it the same way. I have to let go of the meaning I’ve made of things in order to stop blocking my happiness. It’s a decision I must make. No one else can do it for me. In order for the pain of my self-made crucifixion to end, I had to change my perspective. Over the course of the last 14 years or so, I’ve finally come to realize that I’d rather be happy. I’ve come to discover that I actually CAN be happy almost all of the time. I can be peaceful. Twenty years ago I wouldn’t have believed it was ever possible. Now I am living this way. It’s a miracle. I am choosing the resurrection every day. I’m letting go of the crucifixion every day. And, I’m dedicating my life to supporting those who are interested in this too. I feel so blessed for the community we’re creating. Around me I see people cultivating a great willingness. I see many who are challenged and I see many who are rising above the challenges. We are doing it, and we’re doing it together. Over and over again, I see the people around me letting go of their grievances and handing them to Spirit to heal. I see them moving into a greater and greater willingness, and I see their bodies healing, their relationships healing, their finances healing, their self-esteem healing. Everything in their lives is healing. And each one’s willingness inspires another. The more willing we are, the easier it is. This I’ve proved, and others prove it around me every day. Today I feel victorious, because I’m more willing than ever before. Today I feel the resurrection is happening, and the crucifixion is fading from my mind. I put myself and everyone else in my life upon the cross, and now we’re moving on. I’m done with that FOREVER. I Love you, and I thank God for you. We bless each other with our willingness to rise in God and come back into our right minds. Together we truly are leaving the crucifixion behind and choosing our resurrection! Hallelujah! Gratitude is a gift. I’ve realized that there are so many blessings I receive every single day – even when it feels like a difficult day or a painful day, my day is still filled with blessings and gifts. Gratitude is the gift I share with Spirit, with the angels and with all humanity. When there’s a moment of fear or worry, panic, or wounding being able to authentically find the place of gratitude for something, for anything, we’re lifted and shifted. Sometimes I realize I haven’t stepped into gratitude all day. I have days that are so busy, sometimes, and I can’t remember when I stopped just to be grateful. It’s never too late to be grateful. Sometimes I swear I can hear the angels dancing and singing when we’re grateful. Being grateful is the gift we share with Spirit. Thanksgiving brings more to be grateful for. Gratitude is an active spiritual practice, and I’m glad I’m able to be aware of it. I used to be such a complainer and now I am grateful to look for the good and be grateful for it. Sometimes many things go wrong and yet, I can be grateful anyway. I am grateful for that too! I’m grateful for all the difficulties I’ve had and being able to share the benefits I’ve learned with the folks I get to serve. Life really IS good. Gratitude helped me to find that good and share it with others. What are you grateful for? Please share with me in the comments below!! Let’s celebrate together! Taking out the mental and emotional trash is a key element to my Finding Freedom From Fear program. I haven’t offered my Finding Freedom From Fear Spiritual Boot Camp class in six months, but I’m thinking of offering it soon. I’m thinking of doing something special next time I offer it so that people can do the class with a friend or family member, as there is definitely strength in joining with a partner. If you’d like to be on the waiting list so you can join me next time I offer it, you can go here to sign up for the waiting list and I’ll keep you posted. For some, it’s a time of Spring cleaning and clearing away the clutter amassed in the winter. When we’re cleaning out things that have been in storage, in a closet, or a garage or anywhere, we may have amassed a lot of things. There are a couple of approaches we can take. We can throw everything away and just clear the space, or we can go through things and decide what’s worth keeping and what’s no longer valuable. When we take everything to the dump, there’s the possibility that we can throw out some things that are valuable to us and not even know it. When we go through things individually, there’s the possibility that we can trigger old attachments and beliefs. For both of these reasons, it’s so valuable to be clear about our intention before we begin. If we take everything to the dump in one fell swoop, are we thinking that we can avoid pain and suffering by avoiding examining the past? If we look through everything one by one, are we doing it because we’re fearful that we might throw out something that we need? We can approach the taking out the trash in our mind with at least as much attention as we do with the clutter in our home. If we can begin with the intention to be focused on spiritual truth and be helpful to ourselves, we’re going to have a different experience than if we aren’t clear what our intention is. Intention can be so helpful to us to keep us on track. It’s what we hold in our heart that unfolds. When clearing out the past, are we in reaction and fearful? Or, are we loving ourselves free of limited thinking from the past? No one can decide our intention for us – this is our own inner work to do. It’s valuable and it’s also life-changing. No joke – NOW is the time of our resurrection! As we’re speeding to Easter this week, on top of a full moon, it’s a great time to be intentional about releasing the past and taking out the trash in our mind, as well as our life. Let’s be grateful as we take out the trash. With an attitude of gratitude we can do the decluttering mindfully by having a clear intention. And, let’s the heavy lifting to the Higher Holy Spirit Self! We don’t have to figure out how, we learn to allow! Taking out the mental and emotional trash is a key element to my Finding Freedom From Fear program. I haven’t offered my Finding Freedom From Fear Spiritual Boot Camp class in six months, but I’m thinking of offering it soon. I’m thinking of doing something special next time I offer it, so that people can do the class with a friend or family member, as there is definitely strength in joining with a partner. If you’d like to be on the waiting list so you can join me next time I offer it, you can go here to sign up for the waiting list and I’ll keep you posted. In class yesterday, I asked people if they were feeling what I was feeling. It seems like it started on Monday. I’ll call it “energetic weather” for lack of a better term. Sometimes I get a strong sense that there’s an energy that is affecting all of us. I don’t do any research about where it’s coming from. That’s really not important to me. What matters is how I handle it and how I use it for my benefit. For instance, I noticed it on Monday coming back from the retreat. I was feeling SO uplifted by all the breakthroughs people had at our Spring Clearing Retreat. And I was also feeling physically tired from having done so much, but I realize that there was a feeling underneath that was not normal. It felt to me like a tenderness, a vulnerability that wasn’t related to anything I was thinking or feeling. It got more intense on Tuesday, and really became strong on Wednesday. Less so on Thursday. Having to deal with certain issues and decisions related to work felt almost overwhelming to me – very odd. I took a lot of breaks, extra prayer, yoga, walks in nature, baths every day, healthy eating – all to support myself with gentleness through whatever was going on. There are certain times that this energetic weather comes in and I notice that it feels like something we’re all experiencing. Do you feel it, too, this week? I do think it’s important not to just push through, but to be gentle with ourselves. We’re having a human experience, but we don’t have to be super-human. I’ve been resting more and sleeping more. It feels good to self-nurture. I feel it helps to know we’re not alone! In case you haven’t noticed, things are picking up speed and intensity. We’re living in the time of speed. What would take a generation to come to terms with, we’re doing in a year. Right now, we can all bear witness to eruptions of all kinds in all directions. There are explosions of ferocious and deadly weather. Planes crashing. Massacres. Outbreaks of war. The patriarchy is being turned on its side and it’s shaking. Those who feel entitled to profit off of other people’s pain are being exposed. Hatred is coming to the surface, and those who cannot lead with Love attempt to divide and conquer. It’s the intensity of density, the shaking and howling as we rise up to a higher vibration. Those who resist are not going quietly. Are you in breakdown or breakthrough, or can you feel both happening? Very often, there’s a breakdown before there’s a breakthrough. Sometime’s it feels impossible to believe that everything works together for our good. At times it feels insane to even contemplate that everything in this world could possibly work together for our good. Many times, when there are dramatic and intense acts of violence and destruction from nature or from people, it feels as though we’re living in a world that is completely insane. When it feels insane, I focus on increasing my trust and faith that there is only God’s Will, and no other Will, no separate Will. I affirm that if I could see beyond time and space, I would know and see and feel the perfection that is being revealed. As of now, in most cases, I do not know what anything is for (ACIM Lesson 25) and so I can either be terrified or I can place my trust in Love. I cannot handle being terrified, as it feels pointless, and placing my trust in Love has never, ever been pointless, so I go with what works for me. I feel comfort and security in knowing that there is only one will at work in my life, and I can learn to trust it completely. I feel that is my mission. To fully trust and have faith that Spirit is fully good, and there is no ACTUAL opposition to that good, no matter how things appear. Let us learn to rely upon grace. I certainly do. Grace is always available and present. Whether we ask for it or not, it’s activated. Like a Divine Insurance Plan. Our mission is to rise above the battlefield and see all is One. United, indivisible. Grace is Divine Justice at work in our lives. On this we can rely and never doubt, if we choose. Let us know that there is Divine Will and grace at work in the lives of everyone who is having a breakdown right now. Something powerfully good is happening regardless of how it looks. Spirit is in charge. Spirit does not fail and will not fail. On this we depend. We don’t have to make the healing happen, we allow it. Our willingness is all that is required. Ready for some healing? If you’re tired of playing small, and feeling like your stuck of blocked, or your just ready to make a leap in consciousness consider joining me this month in one of the great events we have planned. We have payment plans if that helps you. I’ve come to learn that being obedient to my guidance really works well for me. For so long I was a rebel and didn’t wish to do anything that someone told me. I would even rebel against my own higher intelligence, just so I could be defiant and be the boss of me. Well, that’s the crazy logic of the ego. It’s not logical. And, it’s also not fun. So many people would like to have more fun, more Joy, more Love and laughter in their lives, but they’re too busy trying to figure out better managing and coping strategies, and that was me. When we operate on our own, thinking we have to do it all for ourselves, then life is much harder. But we’re the ones who’re making it that way, and we can change our minds. I would pray for guidance and then reject it. It’s not that I did this from time to time. This was a daily occurrence for me. That’s how intense and strong my defiant rebellion was. The very thought of putting my Higher Holy Spirit Self in charge was scary. As it is for most people. Sometimes, in a class or counseling session, I will suggest that people work with the affirmation “Thy will be done.” Most people cringe at the thought of it. We don’t wish to put Spirit in charge because we fear it will mean the loss of everything we enjoy. The opposite is true. It means the loss of fear, worry and doubt – but you won’t know it until you choose it. It requires a leap of faith. Why pray for Love, support and guidance and then continuously reject it? When we do that, it’s like proving that we’re not worthy of a good life. That’s the message that we’re sending ourselves when we refuse to actually accept the answered prayer. It may seem odd that accepting the answered prayer, and following the guidance, would be what obedience is all about, but I’ve found that it is. It’s not that Spirit is ordering me around. Spirit isn’t separate from me. The guidance is from the Higher Holy Spirit SELF, not separate. I’m being obedient to my own actual desire for happiness when I follow my intuition. It takes courage and willingness to follow our guidance, but it really does lead to a much happier life and a life without fear. We’re getting ready for our Spring Clearing Retreat next week – it’s not too late to join us – and we still have payment plans! TODAY RADIO SHOW: my topic is The Attraction of Guilt. You can listen in LIVE on my radio show – click here for details – or you can click here to get the download later at iTunes or Stitcher for Android. All the previous episodes are free at iTunes & Stitcher right now! Transcripts and more are available here: LivingaCourseinMiracles.com You can subscribe to the podcast and get the show every week automatically on your phone, iPod, iPad or computer. Check it out! And if you enjoy the radio show, will you please write a review so more people find the show? The more reviews, the more iTunes and Stitcher show it to people! Thank you! I talk with many parents, especially moms, who feel guilty if they take care of themselves. Parents often feel guilty for just wishing to take time away from their family. It seems as though parents who are super committed to their family and their children still feel guilty if they take a few days for themselves – even when there’s another parent or grandparents to care for them. Many parents feel they should do even more for their children, even when they’re doing a LOT. The idea of sacrifice comes up frequently. Sacrifice, like crucifixion, is an ego concept that people often feel drawn to, but there’s no part of either that brings benefit to anyone. None. Nada. Nothing. Yes, there are times when we feel compelled to choose to forgo something that’s important to us because taking care of a loved one is MORE important to us- but that’s not a sacrifice. It’s a choice. Sacrifice is a PERSPECTIVE. When we feel we’re making a painful choice, then it feels like a sacrifice. But that doesn’t mean that it is. When we’re making a choice to give up something because we feel we HAVE to, then there’s the sense of sacrifice. But that’s not how this world REALLY works. Sacrifice is unnecessary. Let’s say you give up sleep to take care of your child. Or you stay up all night helping them apply for student loans. Or you work two jobs to put them through college. You don’t have to do it, you choose to do it, because this is what’s important to you. That’s not actually a sacrifice. If we think of these choices as sacrifice, it layers in more guilt for the children. We don’t want our loved ones to feel guilty – or do we? Maybe it’s just family tradition? It’s extremely valuable for the release of pain and suffering to consider everything that feels like a sacrifice. I remember when my Mom was so ill and I was caring for her alongside my Dad. I could have said that it was a sacrifice to take care of her and to be a support to my Dad. I gave up many things in order to do that. But none of them was a sacrifice to me. I would have paid money to be able to be with them. I would have gladly given up more for the opportunity to be a support and to be by their side. Would you like to turn your pain into gain? For every sacrifice you think you’ve made, write it down. Write these things down, make a list. Look at the choices you had and why you chose what you did. If the choice you made FELT like a sacrifice, then be willing to see that you actually were making the choice YOU desired. It may have felt like you had to and you didn’t have a choice, but that’s a trick of the ego. We often have choices, even when we think we don’t. There are plenty of parents who don’t choose to work a second job so their kids can go to a special school. And there are plenty of parents who don’t lose sleep to help their children succeed. We may think it’s a given to do these things, but it’s not. It’s a choice. Get the ego out of the conversation and be willing to see that you made the choice that felt best for YOU. It’s so important, because if you believe there’s been a sacrifice, then your children may well feel guilty that they didn’t deserve your sacrifice. Then you’re perpetuating the painful perspective that is completely false and unnecessary. Instead of thinking that it’s a sacrifice to work a second job, just think of it as what it is: a choice to work a second job instead of having time to do other things. In those moments, the parent feels that this is the best use of their time. That’s not a sacrifice. It’s a heart investment. I would have been MISERABLE if I couldn’t have been able to help my parents at that time in their life. There was no sacrifice, although I did choose to “give up” things that I could have done during that time. I didn’t wish to do any other thing besides serve my parents as best I could and be with them at their side through the whole ordeal, as much as possible. That was my heart’s desire. Let’s not delude ourselves into sacrifice anymore. Let’s not perpetuate the guilt. Make a list of all the sacrifices and turn them into choices. If you’ve made people feel guilty for your supposed sacrifices, forgive yourself and let them know that you realized your error. In this way, you are sure to be truly helpful to others, and you will see yourself free in the process! Yesterday in our Masterful Living Class we were talking about problems. The ego mindset is one of constant problems, never-ending problems, relentless problems, running a gauntlet of problems. We can become identified with our problems. We can become addicted to solving problems. And yet, problems are not coming at us from the world, they are manifestations of our beliefs and they can be resolved by Spirit, if we choose. The Holy Spirit offers you release from every problem that you think you have. They are the same to Him because each one, regardless of the form it seems to take, is a demand that someone suffer loss and make a sacrifice that you might gain. And when the situation is worked out so no one loses is the problem gone, because it was an error in perception that now has been corrected. One mistake is not more difficult for Him to bring to truth than is another. For there is but one mistake; the whole idea that loss is possible, and could result in gain for anyone. If this were true, then God would be unfair; sin would be possible, attack be justified and vengeance fair. T-26.II.2. I used to be what some would call a “drama queen”. I realized that when I was fully identified with ego, I liked having problems because they made me feel alive. Now, I choose to feel alive because I’m experiencing the flow of Love. When we feel like a victim, we’re identified with our problems. It’s a false identification. We’ve abandoned who we really are. We can come back to our true identity in Spirit, which always awaits our choice. The time to choose our true identity is now. What a blessing that we can change our mind and our habits, no matter how ingrained they seem to be. Phew! I encourage you to look at your identification with problems. Are you a person with constant problems? Do you grapple with big problems or little problems? Who will you be without your problems? These are meaningful questions that have really helped me to establish an awareness of my true identity. What do you choose? Yesterday I was blessed to have my dear friend, Lisa Natoli, as my guest on my radio show. Our topic was healing and the hour went by SO FAST. I have to say that I feel like my whole life revolves around this topic and I’m so grateful for the opportunity to heal that is available to all of us all the time. No more managing and coping! This is a powerful time to open ourselves to the healing that is available to us. It’s never been so easy to let the past go and our willingness is all that’s required. Yes, it can feel like peeling an onion – so many layers of burning and painful tears, but it doesn’t HAVE to be like that. We can throw the whole onion in the fire. The week before, on the radio show, Corinne Zupko was my guest and we were talking about having the courage to heal. This is vital to understand because it’s something we can cultivate. Fear can be eliminated and Corinne’s beautiful work helping us to heal anxiety is a testimony to that. We don’t have to struggle with fear and anxiety, it can be dissolved and resolved back to the root cause, even if we don’t know what that root is. That is the miracle that is ours to receive. And BTW, if you’re a radio show listener, last week’s audio was defective, so delete it from your podcast app and then download it again to get the “healed” version! Jesus asked people if they were willing to heal. Without that willingness the healing doesn’t last – no matter what the issue is. We must be wiling to walk in the world in our wholeness and perfection and surrender everything in the mind that stands between us and our natural state. There’s never a sacrifice, merely a surrender. Healing requires surrender of our false beliefs. We can begin now. It’s the perfect time. I surrender, I surrender, I surrender! It takes courage to heal – and that’s why we can be so much more effective working together! Come to one of these healing events this month and we’ll go for it! Jon Mundy and I are offering our Leading & Creating A Workshop training which includes certification to lead my Forgive & Be Free Workshop! March 14 to 20. Register for both and receive an additional discount. Click now for details! And we have payment plans! Posted in A Course in Miracles, Daily Prayer, Healing, Love, Self-Esteem | Comments Off on Wilt Thou Be Made Whole? A Course in Miracles tells us that the healer is the mind itself and no other. If we allow ourselves to accept this, it can open the door to tremendous healing. However, it can also bring with it fear. Healing isn’t complicated, but our feelings often are. Our feelings stem from our belief system. When we believe things that aren’t true we have anxiety and fear. It does often seem as though the fear and anxiety are a natural reaction to our experiences, but it isn’t true and will never be true. We can put 10 people in the same circumstances and some will feel afraid and some won’t, based on their beliefs. One person is terrified of intimate relationships and intimacy, and will avoid it at all costs, but has no problem climbing a rock wall. Yet another person can handle relationships but not the rock climbing. In workshops, I’ve seen people sit on the other side of the room from me behind a table, with the arms folded across their chest, refusing to engage with the rest of the group, who are covering their fear with hostility and defensiveness. Those same people will shift in the course of a few hours in a workshop and become open, available, sweet and helpful. Healing happens when we’re willing to be loving. We can learn so much on our healing journey. SO MUCH! That’s why I like to do the healing in groups, and with friends and like-minded souls. When we go together it’s not so scary and we can accomplish so much more healing! Our willingness to relinquish the beliefs is absolutely required. What belief holds you back from healing? Please share in the comments section below! 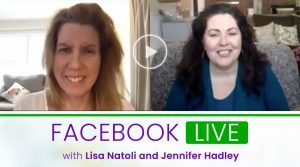 TODAY RADIO SHOW: my guest is Lisa Natoli and our topic is The Healing Cure. You can listen in LIVE on my radio show – click here for details – or you can click here to get the download later at iTunes or Stitcher for Android. All the previous episodes are free at iTunes & Stitcher right now! Transcripts and more are available here: LivingaCourseinMiracles.com You can subscribe to the podcast and get the show every week automatically on your phone, iPod, iPad or computer. Check it out! And if you enjoy the radio show, will you please write a review so more people find the show? The more reviews, the more iTunes and Stitcher show it to people! Thank you! Number one, I cannot feel ashamed unless I’m in self-judgment. Since all judgments are false, I can let my attachment to that which isn’t true go. I can give it to Spirit for healing and I can be willing to focus on that which IS true. Even if I feel ashamed because of someone else’s judgment, it’s only because I’ve agreed. I have the power to change my mind. I have the ability to allow Spirit to assist. I don’t ever have to go it alone! Number two, what’s true, no matter what, is we are each having this human experience in order to be truly helpful by representing Spirit, the one who sent us. This is our holy purpose. There’s no way I can do that and be judging myself and shaming myself. It’s not possible for me to be helpful and be broadcasting a belief that there’s something wrong with me – I know, I tried and failed. All shame is based on a false belief. From shame, there’s no where to go but up. Now, here’s what’s super important – forgive yourself for every single occasion when you tried to shame another person. We don’t realize it, but we often have hidden away all kinds of self-judgment related to trying to make other people feel ashamed or guilty. We can forgive ourselves and go forth and fulfill our holy purpose to be truly helpful. Life is SO very good when we can see our way out of the hell we made. And we can help each other with our healing by releasing all resentment towards those who seemed to shame us or make us feel guilty. Instead, let them be our teachers. Let’s set them free from the prison of our minds and move on! Today’s the day for our sweet release! One of the things we were talking about in my Sacred Circle and in Masterful Living this week is that we often resist the very thing we are desiring most. Consider for a moment the things that you’d most like to see made manifest in your life, your body, your relationships, your finances, your career. Pick one thing that you’d really, REALLY like to see made manifest. Now, can you feel or see that there are some steps you’d need to take toward it that you simply resist doing. For me, this was true for SO MANY years and that’s the thing that made me feel like a spiritual loser and a failure. I was studying and studying spirituality, but I was still SO AWARE of the blocks that were in my own heart. I kept coming up against my own sense of unwillingness to take the action I needed. I didn’t have the courage. That for me was the absolute worst. That awful sense of feeling paralyzed and unable to move forward. It was as if my heart was wearing cement shoes. I kept falling back into the swamp of my own self-judgment. It felt icky and sticky and unconquerable. I’m amazed I didn’t give up! Now, I can see that courage is about choosing FROM Love. Courage isn’t just overcoming fear. Courage is finding the strength to make a higher choice. And that can only come by choosing from Love. I feel that, deep down in my awareness, behind all my fear thoughts, I just knew that there had to be a way out. I also feel that I knew, deep down, or high up in my soul, that there was a method to this madness and that once I found my way out of the quagmire of ego madness, I would be able to share that with people and it would be worth whatever it took to get there. Time is a trick, a sleight of hand, a vast illusion in which figures come and go as if by magic. Yet there is a plan behind appearances that does not change. The script is written. My experience is that we can shift out of one version of the script into a higher one by making loving choices. Obviously, this is not something anyone can do for us. We must do that part for ourselves – spirit will do the rest. It is our willingness that makes it possible to see and feel and sense and know the more loving choices that are available to us. Being grateful for the good we already are aware of raises our vibration so that our perception is more clear. – because like attracts like. When I was overwhelmed and feeling paralyzed and stuck, knowing I was playing small and suffering from getting in my own way, and probably blaming others too rather than accepting responsibility – that was a really awful feeling of failure. I found that prayer could lead me out of it. And that’s why effective prayer is such an important part of what I share in my programs. There’s so much that is possible when we can come together with others for the purpose of healing. I’m thinking of the amazing courage that it takes to choose healing. I never thought of my self as a brave or a courageous person. I was simply unwilling to be imprisoned by other people’s opinions me. I couldn’t bear it. I wouldn’t allow it. Maybe because I was already trapped by my own. I had such a strong belief that something was fundamentally wrong with me and that was the under current of everything in my life. It informed every choice and every decision. I was constantly in reaction to my own feelings of “something wrong with me.” It was the underlying cause of a near-constant anger. I didn’t know then that the cause of the anger was that I was so identified with this false belief of my own unworthiness, my own wrongness. And, I didn’t know that I brought this belief with me into this life in order to heal it and demonstrate that this kind of healing is possible. And because I didn’t know what was going on, and I was so convinced something was fundamentally wrong with me, I would settle for being comfortable in my discomfort. And that really further cemented the belief that I was doomed. I felt a deep sense of doom that I could barely even acknowledge, but it was pervasive and everything in life seemed to mirror it back to me. I no longer feel that something is wrong with me. I no longer feel doomed. I no longer believe that something is fundamentally wrong with me or anyone else. I am willing to see the Christ in all. I am willing and I’m more and more successful every day. And this is why I feel compelled to share. This is SO MIRACULOUS to me. I never imagined I could get out from under that doom and gloom! The great gift of healing that unworthiness is that I no longer take things personally so there’s not much to get angry about it. I do have momentary lapses, but I don’t hang out there, I rise up. I lift my awareness with thoughts of gratitude and Love and I am healed into a higher awareness. I’m lifted and shifted by Love. This is the practice that I now share in my classes. It’s amazing how much we can accomplish. The folks who come to the trainings, retreats and classes with me accomplish far more than I have – truly, they are amazing! In fact, because the healing is so amazing and spectacular, so miraculous, I’ve asked our community to step up and create a community newsletter to share that these kinds of shifts and changes are possible. We are entitled to miracles isn’t just a bumper sticker, it’s the truth. There are so many truth sayings that we’ve become blasé about. The truth can become a cliché that we don’t even notice. I know for myself, I thought I believed that miracles were possible – just not for me. Well, the thing about the truth is that it’s true for everyone. That’s what makes it the truth. Truth is eternally true for everyone, without exception, that’s what the truth is. If it’s not true for everyone, then it’s not true. We were talking about this in Sacred Circle this week too. How I learned about the truth and about being miracle minded is that I started to measure what I was thinking and see if it was truth, or was it just a belief. If it’s not true for everyone then it’s a belief. If it’s a belief, then it’s not true. If it’s not true then what do I need it for? Do the math – it’s not that complicated. This approach really helped me. I started doing everything I could to get some glimpse of truth. I learned that the truth really does set us free. Truth is already available to us – we don’t have to invent it, buy it or get it from somewhere else, it’s already ours! Remember how I said that my belief that there was something wrong with me was underneath all that anger I had? I couldn’t see it until I was willing to look at the truth. The truth is we’re one with each other. Therefore, no one is unlovable, no one is fundamentally bad or wrong or not good. All are from the same source. That’s the truth. I had to be willing to accept that and stop investing in my false beliefs. Truth is true and it’s not a belief. Are you ACTUALLY willing to give up your beliefs in favor of truth? Find a way to join with me or others and PROVE the truth in your life. The only thing to be healed is false belief. When we focus on truth, when we become interested in truth, our interest in false beliefs dissolves and resolves because it’s all smoke and mirrors. There’s no substance to false beliefs. All that we’ve convinced ourselves us will fade into nothing if we let it. If we ALLOW Spirit to do the lifting and shifting. Thank you for praying with me today. Prayer is so powerful. We use technology to transcend time and space and deepen our spiritual practice. And that’s beautiful! I send out a prayer and inspiration 7 days a week (unless, like last week the website malfunctions) and you can join me in prayer. Writing daily inspiration and recording a daily prayer has been a part of my spiritual practice for more than a decade. If you’re not already, you can subscribe, it’s just one of the gifts we offer to support you in keeping your attention on what’s true. Click here to subscribe now. And if you’re tired of playing small, and feeling like your stuck of blocked, or your just ready to make a leap in consciousness consider joining me next month in one of the great events we have planned. They’re on early bird special right now and we have payment plans. For me, it was an old habit to hang onto the past and I did it in so many ways. One thing I used to do is cling to what I thought was supposed to happen. I’d hang onto how I thought it SHOULD be. I had very little flexibility. It’s so obvious, but I didn’t realize that the more flexible I am the more I am able to bend with the shifts and changes that life is sending me. I was less flexible because I was so convinced I knew how it SHOULD be and anything else was not acceptable. I created so much hardship for myself. It’s stressful when we keep looking at things and thinking it’s wrong, it’s not right. We don’t recognize how arrogant it can be to constantly think we know how things SHOULD be. I found great relief in simply realizing that, since I cannot see through all directions of time and space, and I don’t know what things are for (most of the time), why judge anything at all? It doesn’t ever make me happy and it just blocks the flow of Love and healing. It’s a new habit to be open and flexible. The more flexible my mind is, the more open my heart is and the more available I am to the good. We can not be rigid and judging AND also be open and receptive to good. These things don’t go together. We have to choose one or the other. New habits can seem hard to make, but it’s about releasing the old habit and replacing it with the new one. Release and replace. The new habit is so much more enjoyable and carries a much higher vibration of Love and Light and so it immediately becomes more enjoyable and that’s a sweet incentive. It’s so hard to understand sometimes, but it’s true: Our willingness is ALL that’s required. Let’s go for it. New habits for a new life of Love! Yes! Are you in? Life is about remembering the Truth of who you are. It’s about realizing the divinity of ALL life. For most of us humans this remembering feels like learning. It feels like growth, change, and development. Imagine the determination to develop that a single blade of grass has when it finds the strength to break through a cement sidewalk! We humans have within us that very same strength and power plus much more! Is it possible to tap into your strength and power while complaining, criticizing and condemning? No, of course not. How often, instead of encouraging my own impulse to grow and develop, did I talk myself into remaining in the same familiar place? Thousands of times! How many times did I hold onto an outgrown opinion about myself or others? Millions of times! But no more! Now, I’m interested in awakening to the Truth that sets me free and that’s ALL I’m interested in. Let us grow and live with an awareness of God’s unerring grace in our hearts and in our lives. Each and every moment offers us the possibility of new development through learning and remembering. Today you can seize opportunity to listen to your inner voice and, like that determined blade of grass, break through the cement of your old thinking and outdated opinions. God is for you, always with you! Believe it and you WILL see it. You CAN be truly masterful! I AM a learner. I AM willing to access my potential and release the cement of old thinking right NOW! What long-held opinion are you willing to release today? Let’s do it together! We’re not meant to live in fear – which is why fear and anxiety are an alarm bell letting us know that we can course correct NOW! If you’d like to hear more on this topic from A Course in Miracles perspective, click here now to listen to or download my radio show episode: You Are the Treasure. You can also get the transcript there. Sometimes the perfect thing arrives at the perfect time. I’m so grateful that my dear friend, author Corinne Zupko can show us exactly how to transform this anxiety and use it for our GOOD. What a blessing to share! Corinne cracked the early morning anxiety code because she, like me, has completely dedicated herself to living A Course in Miracles. She consistently wakes up in a state of peace, instead of how she used to, which was in the throes of gripping early morning anxiety. 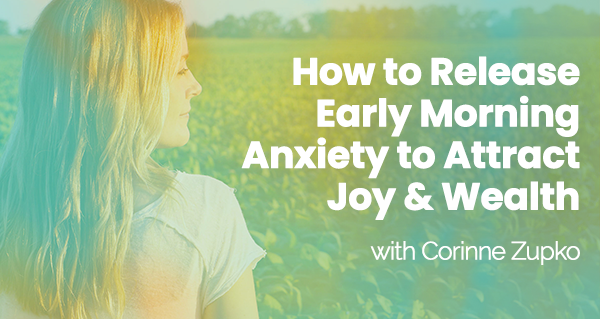 Having been a spiritual counselor for 18 years and a minister for 11, I’ve counseled so many folks who REALLY are coping with early morning anxiety – it’s much more common than you might think. I promise you, you are SO not alone! That’s why I have to let you know about this upcoming FREE class that my friend, Corinne Zupko gave us the other day! There were times I used to wake up in the morning feeling anxious for no apparent reason. Ugh. Can you relate? Sometimes I’d wake up with a jolt of anxiety that would rip right through me – what a way to start the day! Can you relate? Do you ever wake up with an overwhelming feeling of tightness in your chest? And you immediately reach for something to distract yourself from it? UGH!!! When we wake up in this high state of fear, it can be really tempting to forget our spiritual practice and instead, find ways to push through the anxiety and numb it with caffeine and food and social media. After all, experiencing high anxiety can make something like a meditation practice feel excruciatingly painful. Yet, here’s an opportunity to work WITH early morning anxiety and use it for GOOD. How? By allowing it to teach us and open our minds to a greater spiritual awareness that we didn’t know was there! Doesn’t that sound so much better? In her free class – which you can still register for – Corrinne shared some very practical and FUN strategies that you can implement right away, so you too, can move through and heal early morning anxiety, and wake up feeling at peace, feeling happy, feeling so so good! Your mornings can determine the kind of day you will have. Imagine the kind of day, the kind of LIFE you can have when you actually wake up in a state of peace and joy, instead of anxiety and fear? This isn’t some BS thing that won’t work for you – that’s the thing about truly LIVING A Course in Miracles. I really love Corinne’s approach to this, because it is all about getting grounded in God and releasing unconscious guilt and fear. It’s the practical application of ACIM in such a helpful way! Let me be clear here – Corinne is the REAL DEAL. She’s a friend. I hang out with her. I LOVE her and I know her to have really done the work, had the insights, and she’s here to share it with us as a gift. Be prepared to take notes! The replay will be available but only if you register for the FREE class. You’ve got nothing to lose but fear. Woo hoo! Let’s do this! If you’d like to hear more on this topic from A Course in Miracles perspective, click here now to listen to or download my radio show episode: Corinne Zupko–From Anxiety to Love . You can also get the transcript there.